The Bible and history attest to the apostasy of the Christian church. The foundation of the LDS church is divine revelation (testimony of Jesus); a restoration of divine authority, and the gospel of Christ. It is a unique American Christian church; with all beliefs parallel to the Apostolic Church of Christ. It was organized by Joseph Smith on April 6, 1830. The “The True and Living God” page describes some of the differences in their beliefs concerning the character and attributes of God. The “Gospel of Christ” page describes some the differences in their beliefs concerning the principles and administration of the gospel. The “Divine Priesthood” page describes their beliefs concerning the necessity of divine authority to act in the name (authority) of God. The “Gospel Restoration” page discusses dispensations of the gospel, apostasy from the gospel after Christ, and restoration of the gospel. The “Ten Commandments” page offers the original Ten Commandments given to Moses; and explains how the second most important law given to man was lost in the Old Testament. The “Eternal Life” page describes the existence of man as spirits from before the foundation of the earth, through mortal life, death, the resurrection, the Millennium, and eternity. The “LDS Prophets” page describes significant differences in the beliefs of the three main branches of the Mormon church after the death of Joseph Smith.. The “Church of Christ” page describes the existence and organization of the Church of Christ from Jesus to James J. Strang. It tells of the apostasy; when the un-baptized, pagan Roman Emperor Constantine reorganized the church and stood as its absolute head. It also tells of the restoration of the Church of Christ, its demise, and the coming restoration with the gathering of Israel. The “Book of the Law” page describes the restoration of the Book of the Law of the Lord that was the most important books of Scripture; as translated by James J. Strang; and the complete Book of the Law of the Lord. The “Armageddon” page uses Biblical prophesy to prove most of mankind will soon die from plagues more horrible than man can imagine. Fire goes before, pestilence follows, decease is rampant, and famine destroys many who remain. The desolation is to begin with the falling of a “mountain on fire” and “there fell a great star from heaven, burning.” There was another near miss of an asteroid in June, 2002. Here is the story of the beast of Revelations, the image of the beast, the mark of the beast, the number of the beast, Mystery, Babylon the Great, and antichrist. Discover the only Escape From Armageddon. The “Mormon Books” page includes pamphlets for a more in-depth study of particular subjects (e.g. history, faith, God, immortality). Documents are regularly being added to this page. The Mormon Church is truly an American Christian institution. It originated in America and was organized without claiming any association with any other church after the Apostolic Church organized by Jesus Christ. It was founded on April 6, 1830, by Joseph Smith with six of the original members in attendance. The original name was the Church of Christ. It was also called The Church of the Latter Day Saints. The final name was the Church of Jesus Christ of Latter Day Saints. The term Mormon came from acceptance by this people of the Book of Mormon; which is believed to be a record of the early habitation of the Americas by a branch of the House of Israel. It is believed that many of the Native Americans are a remnant of that people. Mormon, translated, means more good. The Book of Mormon was never believed to replace the Bible; but, was accepted as another testament of Jesus and the gospel. The first gathering of this people was in Kirtland, Ohio. Later they settled in Independence, Missouri; which they called Zion; which they believe will be restored when Jesus returns, as the city of Zion. Religious persecution became so severe by Missouri mobs (of which the Governor had been a part) that it culminated in Governor Boggs issuing an extermination order against the Mormons on October 27, 1838. Some of the blackest pages in American History were written in Missouri. The Mormons were tortured, killed, and driven from their homes in the middle of winter, with only the clothes on their backs. They fled to Nauvoo, Illinois; where they established a thriving community. The Missouri mobs followed them. Joseph had been arrested numerous times in Missouri on trumped up charges that were dismissed in court. They managed to have Joseph, his brother Hyrum, and about ten others arrested and held in Carthage Jail. Governor Ford issued an order that they should be protected by state militia. The word spread around Carthage, that there was nothing against these men that the law could reach; but, powder and ball would! The Governor was made aware of the situation. On the morning of June 27th, 1844, he disbanded the militia and sent them home. About six o’clock a mob of about 250 men, painted red, black, and yellow stormed the jail and murdered Joseph and Hyrum. Innocent blood stained the constituted authorities of the United States. Another black page of American history was written. After the murder of Joseph Smith, the church divided into two groups. The first group was organized by James J. Strang at the very moment of Joseph’s martyrdom on June 27, 1844; although 400 miles away in Wisconsin. Mr. Strang claimed to have been ordained at the hands of angels; and later received a letter of appointment from Joseph. Both the appointment and the divine ordination were required by their laws, included in their Doctrine and Covenants, to stand at the head. This group first gathered to Voree (near Burlington, Wisconsin); and then to Beaver Island in northern Lake Michigan. These became known as the Strangite Mormons. 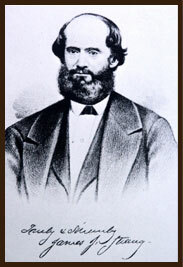 Mr. Strang was assassinated by two apostate members on June 16, 1856, was returned to Voree, and died on July 9th. He left no successor, the people were scattered, and only a remnant of that people remain. One group, under the leadership of Vernon Swift, reorganized their church in 1961, into a corporation. Every corporation is a “fictitious” entity that exists only in the mind of civil law. They organized a new order of the priesthood to rule their church; and use the corporation by-laws to govern their church. These have been referred to as the Swiftites. Many of the original members retained their original identity, priesthood, and laws of God. I was ordained an elder, in this extension of the original church, on July 8, 1956. Biblical prophecy foretells that only a very small remnant of the people of God will be on the earth when Jesus returns. Click here to read more about James J. Strang as a prophet of God. The second group was organized by Brigham Young, President of the Twelve Apostles. On August 15, Brigham announced that Joseph’s place would never be filled by another; and that the Twelve Apostles had authority to govern all the affairs of the church. These were known as the Twelvites. 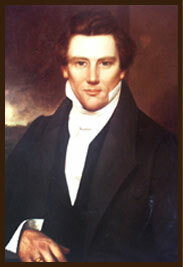 On December 24, 1847, they admitted their church needed a prophet, like the Strangites. Brigham Young was elected by a vote of the people to be their prophet. Without appointment by Joseph, and without divine ordination, he stood as their First President. While migrating west to remove themselves from the United States, they learned of California joining the union. Brigham stopped their convoy; and established their organization in the Salt Lake Valley. They have been referred to as Brighamites. Other groups have been organized and some have disappeared. The third major group began in 1856; when two former Strangites, Jason W. Briggs and Zenos H. Gurley, went to Joseph, the son of the Prophet, and advised him that he should succeed Joseph. In 1860, Joseph Smith III accepted leadership of this Reorganized church. Having no claim to divine priesthood themselves, Briggs and Gurley ordained young Joseph to be their prophet. The church was again reorganized in 1985; and divided over doctrinal issues. The main body changed their name to the Community of Christ, became ecumenical, and joined the NCC and WCC. The other group has tried to maintain their original doctrines. Both are headquartered in Independence, MO. Doctrinal differences between the various groups remain in Mormonism today. As an elder of the Strangite group, I can speak only for the teachings of that group; which were taught by Joseph Smith and James J. Strang. All Mormons believe in God, the heavenly Father, in His son, Jesus Christ, and in the Holy Ghost. They all accept Jesus Christ as the Messiah and Savior of mankind; and in the gospel of Christ. They “believe in being honest, true, chaste, benevolent, virtuous, and in doing good to all men.” (Joseph Smith) The word “man” used on this site generally refers to both men and women. The word Mormon has been used in derogation against the latter day saints for their belief in the Book of Mormon; even as the word Christian was used against the former day saints. The meaning of the word Mormon was actually an omen of its contents. Joseph Smith wrote, “we have the word MORMON; which means, literally, more good.” The Book of Mormon was never held to replace the Bible. It is accepted as information concerning the people (“other sheep” mentioned in the Bible–John 10:16); who lived on this continent from 600 BC to 400 AD, their beliefs in Jesus Christ, and Christ’s ministry among them after His crucifixion. It also includes an abridged history of a people that migrated to this country at the time the language was confounded in the days of Pelig. It is accepted as another part of Scripture, more good, to use in understanding God’s relationship with man, his duty to Him, and his duty toward his fellow man. It is another testament of God’s work in offering eternal life to man. This Web site will specifically address the Mormon Beliefs of the group known as Strangites. Although the beliefs discussed on this site are noted as Mormon beliefs, they do not necessarily represent the beliefs of either the Brighamite (Utah) church, or the Reorganized (Independence) church (Community of Christ). Specific differences in the beliefs between Mormon groups are addressed on the “LDS Prophets” page. Additional information on the organization and rise of the Church of Jesus Christ of Latter Day Saints may be found in the “Church of Christ” page and in the “Mormon Books” page. A basic Mormon tenant is the pursuit of truth. The mind can imagine a thousand things to be true. Among the thousands of different doctrines in Christianity, only one can be true. The requirement to honor the Sabbath is an absolute law of God. It is a sign between God and His people that was to be obeyed forever. (Ex. 31:17) Yet, the majority of Christian churches honor Sunday as the Sabbath. Only one of these doctrines can be true. The Bible never honors any day; except the seventh. In 321 AD, Constantine, an unbaptized, pagan Roman Emperor, who worshipped the sun god, issued an edict making Sun day the day of rest; as it was “the venerable day of the sun.” Sylvester, who was then bishop of Rome, officially changed the Christian Sabbath to Sunday. The Jews continued to honor the seventh day. Truth represents an established or verified fact that is in agreement with a standard. Every science has its verified facts; as established by standards recognized by each discipline. Theology is that revealed science that deals with spiritual truth, the relationship between God and man, man’s duty toward God, and man’s duty toward his fellow man. Mormons believe in truth regardless of its source. “And do thou grant, Holy Father, that all those who shall worship in this house may be taught words of wisdom out of the best books, and that they may seek learning even by study, and also by faith.” (Doctrine and Covenants, 109:14) History may often be used to clarify a question; as in the Sabbath issue. A basic requirement for gathering information is the use of a standard. The standard for measuring the validity of a particular doctrine has generally been the Bible. Mormons believe in the Bible to the extent it has been translated correctly and use the King James Version as a standard. They also use all Bible translations and informational sources as references (e.g. N.E.T., Language Dictionaries, Book of Jasher, Dead Sea Scrolls, etc.). The Book of Mormon and the Doctrine and Covenants are used as reference sources among Mormons. Among Strangite Mormons the final basis for resolving most doctrinal questions is the Book of the Law of the Lord. It is included with notes by James J. Strang on the “Book of the Law” page. A basic principle of truth is elimination of bias (error); which can result by either the use of an inaccurate source, or an improper evaluation of information. There is no original text of the Bible. There have been numerous changes, lost books, books that are of questionable authenticity, and mistranslations. Mormons, therefore, accept the Bible to be the word of God to the extent that it has been correctly translated. The voice of the people is not the voice of God. Remember the words of the people, “Crucify Him.” Only the words from a prophet/apostle of God represent the voice of God. Many believe doctrines because that is what they want to believe. This is what their personal associations believe (friends, relatives). People want to be part of the crowd; and receive their recognition. Their is also an illusory security felt belonging to a large group. Fish use this tactic; but, are often all consumed by a large predator. The fact that others believe Sunday is the Sabbath does not make true. It only makes it permanent in closed minds. When there are opposing doctrines, both can be false; but, only one can be true. Each doctrine must be clearly defined and tested against a standard. As an example, let us presume that baptism is not an essential ordinance of the gospel of Christ. Now for the test using the standard. Baptism is mentioned 75 times in the Bible, baptize 52 times, and baptized 187 times. If the ordinance was not essential, one must ask why it was given so much attention. Jesus taught, “Verily, verily, I say unto thee, Except a man be born of water and of the Spirit, he cannot enter into the kingdom of God.” (John 3) Jesus explained, “He that believeth and is baptized shall be saved; but he that believeth not shall be damned.” (Mark 16:16) Using the Bible as a standard there are sufficient quotations to establish that baptism is a required ordinance of the gospel of Christ. The spiritual laws of God are, like Him, unchangeable. They are the same yesterday, today, and forever. Whatever it took to save men in the days of Adam will be the same today and forever. If the plan of salvation was changed, no one could have confidence in any one plan; as it would demonstrate a defect in the God. As long as there is a living God and an obedient and faithful people, there will be revelations, new knowledge, and a basis for additional valid testimony. Among Mormon beliefs are those noted in a letter of Joseph Smith on March 1, 1842; which have been termed The Articles of Faith. This was not intended as a creed. Joseph Smith always spoke against creeds created by the hand of man. We believe in God, the Eternal Father, and in His Son, Jesus Christ, and in the Holy Ghost.2. We believe that men will be punished for their own sins, and not for Adam’s transgression. 3. We believe that through the Atonement of Christ, all mankind may be saved, by obedience to the laws and ordinances of the Gospel. 4. We believe that the first principles and ordinances of the Gospel are: first, Faith in the Lord Jesus Christ; second, Repentance; third, Baptism by immersion for the remission of sins; fourth, Laying on of hands for the gift of the Holy Ghost. 5. We believe that a man must be called of God, by prophecy, and by the laying on of hands by those who are in authority, to preach the Gospel and administer in the ordinances thereof. 6. We believe in the same organization that existed in the Primitive Church, namely, apostles, prophets, pastors, teachers, evangelists, and so forth. 7. We believe in the gift of tongues, prophecy, revelation, visions, healing, interpretation of tongues, and so forth. 8. We believe the Bible to be the word of God as far as it is translated correctly; we also believe the Book of Mormon to be the word of God. 9. We believe all that God has revealed, all that He does now reveal, and we believe that He will yet reveal many great and important things pertaining to the Kingdom of God. 10. We believe in the literal gathering of Israel and in the restoration of the Ten Tribes; that Zion (the New Jerusalem) will be built upon the American continent; that Christ will reign personally upon the earth; and, that the earth will be renewed and receive its paradisiacal glory. 11. We claim the privilege of worshipping Almighty God according to the dictates of our own conscience, and allow all men the same privilege, let them worship how, where, or what they may. 12. We believe in being subject to kings, presidents, rulers, and magistrates, in obeying, honoring, and sustaining the law. 13. We believe in being honest, true, chaste, benevolent, virtuous, and in doing good to all men; indeed, we may say that we follow the admonition of Paul–We believe all things, we hope all things, we have endured many things, and hope to be able to endure all things. If there is anything virtuous, lovely, or of good report or praiseworthy, we seek after these things. JOSEPH SMITH. (1) We worship the only living and true God – the God of Abraham, Isaac, and Jacob. (2) We believe that without revelation from God, there can be no claim of either a priesthood of God, or a knowledge of spiritual truth. Our foundation is the testimony of Jesus, “for the testimony of Jesus is the spirit of prophecy.” (Rev. 19:10) (3) We believe in a priesthood called and ordained by the will of God. (4) We accept Christ (the anointed) as the only path to eternal life. (5) We believe in the gospel of Christ as taught in the Bible. (6) We believe the seventh day of the week is the Sabbath of the Lord. (7) We believe all ten commandments; as given by Moses and our Lord Jesus. (8) We believe that unless men are faithful and obedient to the end of their lives, they can have no hope of eternal life. We all lived together as spirits; since the beginning. The plan of salvation existed before man walked on the earth. Lucifer rebelled against God, was cast down, and took a third of the spirits with him. They can never receive either a mortal, or an immortal physical body. After the resurrection of Jesus, Lucifer and his followers were cast out of heaven to the earth (Rev. 12:9). During the Millennium they will be chained in the bottomless pit. After the second resurrection, they, and the sons of perdition from mortal life, will be cast out for eternity. Jesus commanded, “And he said unto them, Go ye into all the world, and preach the gospel to every creature.” (Mark 16:15) Yet, the pure and simple gospel of Christ was adulterated with paganism from its earliest of days. Those who knew God and the gospel, and yet perverted such knowledge, have the blood of all men after them on their skirts. The loss of the gospel and divine authority is a subject of importance both in the Bible and in ecclesiastical history. Their inequity caused the Church of Christ to be taken from the earth for 1,260 years (Rev. 12:6). Rome, the beast of Revelations, was given power, “to make war with the saints, and to overcome them: and power was given him over all kindreds, and tongues, and nations.” (Rev. 17:7) “And here is the mind which hath wisdom. The seven heads are seven mountains, on which the [beast] woman sitteth.” (Rev. 17:9) There has always been only one city known synonymously as the city of seven hills. This beast and image of the beast have assured that most men will never understand the gospel in the flesh. But, all men are given an understanding of their duties toward their fellow man. Even the remotest tribe, appreciates duty toward their fellow. Every culture recognizes such responsibilities (love for his fellow, honor toward parents, killing, adultery, stealing, lying, and seeking the property of others). The Ten Commandments originated with Adam. Had there not been a law against killing, Cain would have come under no penalty. There are good and honorable men in every society and every religion. The attribute of justice in God demands their works be rewarded in eternity. Those who know God, obey His commandments, endure faithful to the end, and are found worthy will inherit the Celestial Glory. A glory so wondrous that it can only be compared as the sun is to the stars. “40 There are also celestial bodies, and bodies terrestrial: but the glory of the celestial is one, and the glory of the terrestrial is another. 41 There is one glory of the sun, and another glory of the moon, and another glory of the stars: for one star differeth from another star in glory.” (1 Cor. 15) Here, men are sons of God and enjoy companionship of their families in mortality and live in the presence of the Father and the Son. “For whosoever shall do the will of my Father which is in heaven, the same is my brother, and sister, and mother.” (Matt. 12:50) These become ministering angels to the lower Terrestrial Glory (glory of the moon). Those of the Terrestrial Glory are honorable men of the earth, who were blinded by the craftiness of men, and who accept the gospel in the spirit. They are entitled to join immortals in the Terrestrial Glory. This glorious kingdom is compared as the moon is to the stars. These become ministering angels to the Telestial Glory (glory of the stars). Those of the Telestial Glory did not accept the gospel of Christ in either the flesh, or in the spirit. They are judged according to their own works in the flesh. Every man will receive a dominion based on those works. They have no part in the first resurrection. They were cast down to hell (spirits in prison) until the fullness [end] of times. They are resurrected with the rest of the unjust after the Millennium. The kingdoms within this glory are as numerous as the stars in the sky; as the works of man are as diverse as the stars. Every man will receive a reward that is appropriate to his nature. Here are liars, sorcerers, adulterers, whoremongers, and every one that loves and makes a lie. A knowledge of God and an opportunity to worship Him and obey the gospel of Christ in the flesh are the most prized possessions of this life. The first principles of the gospel are very simple. The first key is faith, “But without faith it is impossible to please him: for he that cometh to God must believe that he is, and that he is a rewarder of them that diligently seek him.” (Heb. 11:6) Certainly Jesus fulfilled this requirement. He walked in faith all the days of His life. The second key to eternal life is repentance. “From that time Jesus began to preach, and to say, Repent: for the kingdom of heaven is at hand.” (Matt. 4:17) “I tell you, Nay: but, except ye repent, ye shall all likewise perish.” (Luke 13:3) This repentance is fully realized only through baptism which washes away previous sins. (Only mortal sins cannot be washed away, e.g. shedding of innocent blood) “John did baptize in the wilderness, and preach the baptism of repentance for the remission of sins.” (Mark 1:4) Repentance, then, is not complete without baptism by water. An in-depth study of the gospel of Christ is found in the “Gospel of Christ” page. No one can minister “in the name of” (authority of) God without being called by Him. “Beginning from the baptism of John, unto that same day that he was taken up from us, must one be ordained to be a witness with us of his resurrection.” (Acts 1:22) The saving ordinances of the gospel are of no consequence; unless administered by one called of God. Only one holding the Melchisedec Priesthood has divine authority to baptize with water and the Spirit. More information on a ministry called of God is on the “Divine Priesthood” and “Gospel Restoration” pages. Man is responsible to himself, his family, and to his neighbors. Men must care enough for themselves to assure they abide by the will of God. Salvation must be a subject of the greatest importance. When boys reach manhood, they are to take a wife. What a simple way to prevent many of the evils that befall men. Man is not complete without woman. “Nevertheless neither is the man without the woman, neither the woman without the man, in the Lord.” (1 Cor. 11:11) Through their children they become one flesh; and fulfill the law. The Biblical history of man from Adam to Abraham is told through their first born sons. The law of God on spiritual marriage is different than the law of man (and other Christian ministers). The first requirement for marriage is love. In Israel the man and woman were often first joined by a betrothal (espoused). It was a civil contract of marriage; granting all the benefits, duties, and responsibilities of marriage. Spiritual marriage is administered by one holding the Melchisedec Priesthood. These have divine authority to bind on earth and in heaven. Such a marriage unites the family in death, the resurrection, and for eternity. Those not holding divine authority can only marry “until death do us part.” How sad! But, the Jew’s rejected Christ; and the gospel dispensation ended. Exactly forty years later they were almost totally destroyed by the Roman Army. After Jesus was resurrected, a gospel dispensation was given to the Gentiles. “And he said unto them, Go ye into all the world, and preach the gospel to every creature.” (Mark 16:15) This was the second half of that dispensation. The woman, the Church of Christ, fled into the wilderness for 1,260 years. In chapter 13, John tells us, “7 And it was given unto him [Satan] to make war with the saints, AND TO OVERCOME THEM: and power was given him over all kindreds, and tongues, and nations.” The second half of the Dispensation of the Meridian of Time was closed; and the gospel and Church of Christ was taken from the earth. In 325 AD, Constantine reorganized the Christian church. He was an unbaptized, Roman Emperor that was loyal to the sun god. Constantine changed the God of Israel to the Trinitarian god of the pagans. He established the civil power of Rome in place of divine authority; and stood as the absolute head of the Christian church. He changed the Sabbath from the seventh day to the “venerable day of the sun.” He turned Christianity into paganism with Christian names. After the 1,260 years, there was to be a gospel restoration; and the Church of Christ would return in the first half of the Dispensation of the Fullness of Times. John foretold of this restoration in Chapter 6, “6 And I saw another angel fly in the midst of heaven, having the everlasting gospel to preach unto them that dwell on the earth, and to every nation, and kindred, and tongue, and people.” The first half of this dispensation was to go to the Gentiles. All Mormon groups believe in this restoration of the divine priesthood, gospel restoration, and Church of Christ by Joseph Smith. He has been the only one to make such a claim; and establish the same church order. He gave his life for his faith. Christians have been told that revelation, and the gifts of the Holy Ghost, ceased with the Apostles. Why? The same reason God stopped speaking to the Gentiles. Christians had returned to paganism. The Bible is a history of God’s relationship with His people. Every book of the Bible was written by a prophet/apostle of God. He walked with Adam (Gen. 3:8), spoke with Noah (Gen. 6:13), feasted with Abraham (Gen. 18), wrestled with Jacob (Gen. 32), conversed with Moses face to face (Ex. 33:11), appeared to Ezekiel (Ezek. 1:26, 27), and spoke and ordained Jesus (Heb. 5:5). He inquired of them which of the religious sects was correct. He was told to join none of them; that they were all an abomination in His sight. After discussing this vision with local ministers they persecuted and reviled him. But, like Paul, he knew that he had seen a vision and that the personages were real. At the age of about eighteen, the angel Moroni appeared to him three times in one evening and twice the next day. He taught young Joseph prophecies from the Old Testament and told him about a record of the ancient inhabitants of this continent that had been buried on a hill nearby. He went to the place shown to him by the angel and found the records buried there; but, was instructed that the time had not yet come for them to be delivered to him. He went to the same place at the end of every year, for four years. He received the records and Urim and Thummim on September 22, 1827. A small part of the translation began with Martin Harris on April 12, 1828. It was not until April 7, 1929, that the full translation began with Oliver Cowdery as scribe. The Book of Mormon was finished in early 1830; and the first edition was published. Eleven reliable witnesses testified to the validity of the plates. The plates from which the book was translated were given back to the angel Moroni on May 2, 1838. On April 6, 1830, Joseph Smith organized the Church of Christ with six members in attendance. The church was organized as an unincorporated church according to the laws of the state of New York and the freedom of religion provision of the United States Constitution. The name was later changed to the Church of Latter Day Saints and finally to the Church of Jesus Christ of Latter Day Saints. In 1919, the followers of James J. Strang added the word “True” to distinguish them from the other Mormon groups. The story of the rise and progress of the latter day saints remains both a unique and one of the blackest in American history. They first settled in Kirtland, Ohio. After severe persecution they left and gathered in Jackson County, Missouri. In 1833, several were murdered, one whipped to death, a number shot, and others whipped until they were literally cut to pieces and left to die. Many of the saints fled to Clay County, Missouri. In 1836, they were informed by the citizens of Clay county, Missouri that they could not dwell there any longer. In 1838, the mobs again began to harass and disturb them by stealing their cattle and hogs, burning their houses, and shooting at their men. Governor L. W. Boggs was well acquainted with the operations of the Missouri mob; having been the leader of it, once, himself, at the time it raged in Jackson County. For no other reason than religious discrimination, he ordered, “The Mormons must be treated as enemies, and must be exterminated, or driven from the State, if necessary for the public peace.” With the assistance of Governor Boggs, 12,000 residents of the state of Missouri were driven from their homes, their property confiscated, about 60 cast into prison, and many men, women, and children murdered. When a mob gathered in Carthage on the morning of the 27th, the Governor disbanded the troops that were used for protective custody; leaving the Smith’s and three or four friends to be guarded by only eight men. At about 6 o’clock in the afternoon the guard was surprised by an armed mob of more than 200; painted red, black, and yellow. They busted into the jail and in a tornado of bullets killed Joseph and Hyrum and wounded John Taylor. The martyred blood of Joseph Smith and Hyrum Smith stained the soil of Illinois by mob violence; while under the pledged faith and protection of the Governor. Their murderers were never convicted of that hideous crime. “As a Seer, I have seen the visions of the Almighty, and as a Revelator have received knowledge of his purposes and commandments, and made them known among the children of men. As a translator, I have brought forth hidden treasures, and revealed the old record to all who love the truth, and seek unto it. The visions of the past and the hidden lore of future ages are laid by the side of present hopes and future knowledge. “As an apostle I have borne a faithful testimony of the kingdom and the coming of the Lord Jesus. I have fought a good fight. I have kept the faith. I have not shunned to declare the whole counsel of God. In the treasure-house of the Almighty there is laid up for me a crown of glory richer than all diadems of earthly kings. In 1856, Thomas Bedford and Alexander Wentworth, who had been punished for sexual harassment of church women, organized a mob to kill James. Their plot involved using the U. S. Iron Steamer Michigan. On June 16, 1856, Captain McBlair sent the Pilot to James’ house requesting him to go on board the man of war. As they stepped upon the pier, Bedford and Wentworth closed hastily behind them. Wentworth fired a revolver at the back part of James’ head. James fell to the ground and Wentworth shot him again. As James rolled over, Bedford fired a marine pistol into his back. They quickly fled back on board the Michigan and claimed protection of the officers. The Captain refused to give custody to the local sheriff. The boat’s surgeon came ashore and pronounced the wounds mortal. Bedford and Wentworth escaped under U. S. protection, were taken to Mackinac, held in jail about five minutes, and then released. Through Joseph Smith and James J. Strang, the Gentiles were offered the same blessings and curses as Israel under Moses and Jesus. In general, they were disobedient. The Gentiles killed prophets of God; even as Israel before them. Joseph Smith was murdered on June 27, 1844, while under the protection of the Governor of Illinois. James J. Strang was shot by assassins, died on July 9, 1856, and his assassins were set free. In 1961, one group of the Strangites, under the leadership of Vernon Swift, reorganized their church into a corporation. Every corporation is a “fictitious” entity; existing only in the mind of the law of man. They established a new order of the priesthood to rule them; and use their corporation by-laws to govern them. They have been called the Swiftites. The time of Israel, when they will be gathered and once again become the people of God is only a few years away. The time for the destruction of most of mankind is so close that people are feeling it all over the world. Two-thirds of Israel are to die; and about 90% of the Gentiles. Before the dreadful day of the Lord, the fullness of the gospel/priesthood will return to the House of Israel in the last half of the Dispensation of the Fullness of Times. In 1997, exactly thirty years after the times of the Gentiles was fulfilled, the same comet that marked the birth of Abraham, comet Hale-Bopp, revisited planet earth. Could this be only a coincidence? Or, is the dispensation to the House of Israel at hand? A very small remnant of the Gentile dispensation is to remain and be delivered shortly before Jesus returns. Maybe the fact that only a remnant remains of the original Strangite Mormons is our greatest asset. Before every major dateline event, there have always been only a few. Remember Jesus words, “Nevertheless when the Son of man cometh, shall he find faith on the earth?” (Luke 18:8) “And as it was in the days of Noe, so shall it be also in the days of the Son of man.” (Luke 17:26) Only eight souls escaped the flood. “28 Likewise also as it was in the days of Lot…30 Even thus shall it be in the day when the Son of man is revealed.” (Luke 17) How many escaped the destruction of Sodom? Lot, his wife, and his two daughters. After Jesus was crucified and the gospel dispensation passed to the Gentiles, how many of the disciples gathered to hear Peter? “…the number of names together were about an hundred and twenty.” (Acts 1:15) How long was the House of Israel left in the wilderness under Moses? How long was it after the Jews rejected Christ before they were destroyed? Exactly forty years. Could this be the approximate time of the last generation? Forty years has been the length of Biblical generations. When David wrote of the return of Jesus, he recalled the forty years that Israel wondered in the wilderness (Psalms 94-96). Eternal life (Celestial Glory) is possible only through gospel faith, knowing and worshipping the one true God, obeying the gospel of Christ, and enduring in obedience to the law of God until the end. A detailed discussion of the gospel of Christ is found on the “Gospel of Christ” page. Time may be our most scarce resource. The forty year generation will end in 2,007. People all over the world are expecting a dramatic change on the earth in the near future. The July 1, 2002, Time magazine noted that “59% believe the prophecies in the Book of Revelation will come true.” Soon that time known popularly as the Apocalypse, Armageddon, and the End Times will overtake us. The people of the world were baptized by water, without repentance, in the days of Noah. They are to be baptized by fire, without repentance, in the day of the Lord. “Behold, the day of the LORD cometh, cruel both with wrath and fierce anger, to lay the land desolate: and he shall destroy the sinners thereof out of it.” (Isa. 13:9) “For this is the day of the Lord GOD of hosts, a day of vengeance, that he may avenge him of his adversaries: and the sword shall devour, and it shall be satiate and made drunk with their blood: for the Lord GOD of hosts hath a sacrifice in the north country by the river Euphrates.” (Jer. 46:10) The islands of the sea spoken of in Scripture is North and South America. This is the land of Zion. The north country is North America. The land of Zion is North America; spoken of in the Bible as the “north country.” The “daughter of Zion” is the remnant of the last Gentile dispensation of the gospel people in this land. The “tower of the flock” was James J. Strang; through whom the first dominion on earth was established in the last days. The kings and counselors were to be lost and the people scattered to (spiritual) Babylon; which is wickedness and confusion. Surely, that is an accurate description of our people, the followers of James J. Strang. “9 Hear this, I pray you, ye heads of the house of Jacob, and princes of the house of Israel, that abhor judgment, and pervert all equity. 10 They build up Zion with blood, and Jerusalem with iniquity. 11 The heads thereof judge for reward, and the priests thereof teach for hire, and the prophets thereof divine for money: yet will they lean upon the LORD, and say, Is not the LORD among us? none evil can come upon us. 12 Therefore shall Zion for your sake be plowed as a field, and Jerusalem shall become heaps, and the mountain of the house as the high places of the forest.” (Micah 3) All is not well in Zion! The stick of Joseph is a book (record) of the seed of Joseph. Joseph Smith was of the tribe of Ephraim, the youngest son of Joseph, the son of Israel (Jacob). He translated an abridgment of the Book of Mormon; a record of the seed of Joseph that had migrated to the Americas– the land of Zion. They left Jerusalem in 600 BC and lived until 400 AD; when they were destroyed by their enemies (a remnant of which are the Native Americans). James J. Strang was of the tribe of Judah. He translated the Book of the Law of the Lord— a book of Judah. Note that the stick of Judah was to come forth after the stick of Ephraim. The works of Joseph and James are united into one work. Next comes the gathering of the House of Israel– the harvest dispensation. When reading prophecy, we must note whether the description is either literal, or symbolical. Mountains mean kingdoms when used symbolically. The “mountain of the LORDS’s house” is the kingdom of God. This is the kingdom of God on earth, with Jesus reigns as King of the earth. Again, note that the Book of the Law is to go out from Zion. My Melchisedec Priesthood is only four generations removed from James J. Strang; who claimed his was from God. Every claim must be verified by investigation. The scale for weighing truth has always been, “To the law and to the testimony: if they speak not according to this word, it is because there is no light in them.” (Isa. 8:20) Weigh the teachings on this site with those in the Bible. The kingdom of heaven is at hand [within your reach].